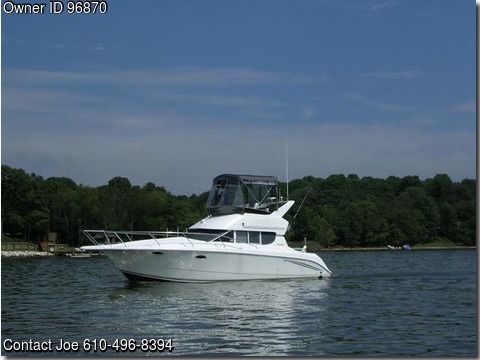 BOAT OWNER'S NOTES: 1997 SILVERTON 312 SEDAN CRUISER, "WET DOG" MUST SELL, call Boat Owner Joe @ 610-496-8394. OVERVIEW: This Sedan Cruiser is the perfect size boat with all the comforts of home including, but not limited to, central air and heat, It is affordable and easy to handle while making memories, taking leisurely cruises or exploring new anchorages. FEATURES & EQUIPMENT: This vessel with accommodations for 6 has a bright, airy salon, The generous 11’ 6” beam allows for great cabin space comfort, The contemporary natural cherry wood and laminate finished cabinetry line the starboard side; while the convertible dinette on the port side comfortably sleeps 2 (Wall to wall carpeting throughout), The electrical panel box and stereo are both conveniently located in the salon, The adequate galley is equipped with 2 burner stove, refrigerator/freezer (110v – 12 v) microwave and storage cabinets and drawers, Once past the galley to the port side is the 2 bunk berth with locker and to the starboard is the head with shower, sink, vanity, mirror and waterproof outlet, You would be surprised at the comfort of the private, forward stateroom with large berth, chest of drawers, cedar lined wardrobe locker designer mattress cover & pillows and flat screen TV, For your safety this boat is equipped with a Halon system, bilge blowers and pumps, engine alarms, fire extinguishers, life jackets and parallel start switch, Of course, all outlets are GFI. Ascent to the flybridge is easy on the molded fiberglass steps, It is a favorite gathering spot which features radar arch, bridge helm & companion seats and bridge lounge seating – plenty of seating for family & friends, No matter where your are, the view from the flybridge is amazing, In case of inclement weather, there’s a Bimini Top with full isinglass to enclose the bridge. The inboard powered boat with turning v-drives is equipped with 2 marine power 350HP gas engines (top ends of both rebuilt only 50 hours ago! ), Because it is EFI, fuel consumption is only 8 gallons of gas per hour/per engine at 32 RPM. These engines have been professionally maintained, Not only is steering a breeze with the hydraulic steering system but anchoring is just as simple as this boat is equipped with a windlass. No matter what it is you like about boating, this is the boat for you, Cruising, anchoring, fishing or even just staying at the marina, This boat is ready for it all! What better way can one enjoy the water with all the comforts of home? Please feel free to call me @ 610-496-8394.